One way to boost your SEO is to make it easier for search engines to crawl your website. When you use structured data to mark up content, you help Google better understand its context for display in Search, and you achieve better distribution of your content to users from Search. The markup data standard is supported by not only Google but all Search solution providers including Microsoft, Yahoo, and Yandex as well as participation by the larger web community, who communicate and publish their standards through “Schema.org“. Most people are not technical, and even if they understood the concept of “Rich Snippets” they wouldn’t know how to implement this on their website. You might not know this about me, but I’m not a very technical person (gasp!). I don’t know how to code, and I’m not a technical SEO wizard. However, I recognize the importance of getting technical when you have to. Adding structured data, also known as schema markup, to your site is one of the more technical things I do. It can give you a significant SEO boost and increase your rankings. Now I’ll admit, there can be a little bit of a learning curve here. 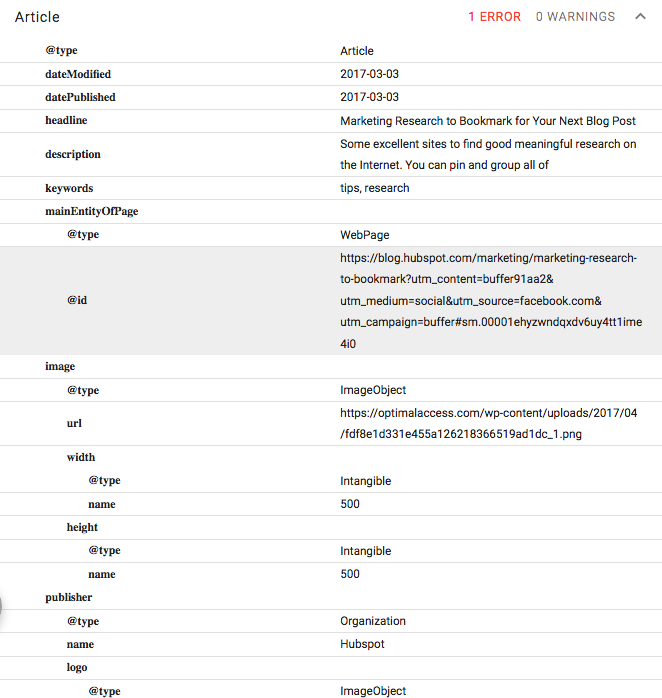 We have created a solution that lets you turn your curated content into a well organized structured page, boosting your SEO, and you don’t need to know anything about structured data to create and host these pages on your website. To see the difference between a “Structured Page” and an “Unstructured Page” let’s take a look at each example side by side. Our KBucket solution for sharing curated content is structured. To the naked eye, it simply looks like a Pinterest type page, with a number of content channels (The Groups tabs on top and the channels pages below) and a tag cloud for filtering and navigating the content. 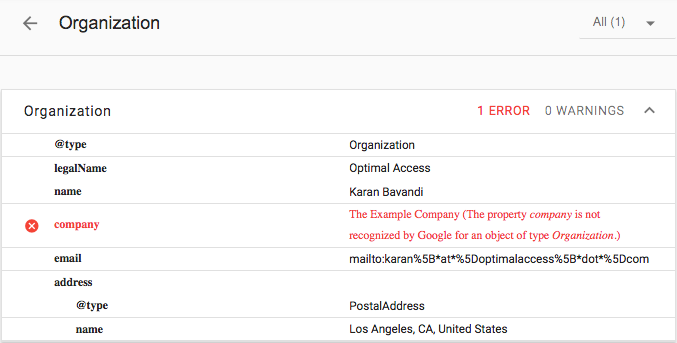 However when we plug-in the URL for our KBucket page into Google’s “Structured Data Testing Tool” We can see what the search engines see when looking at the page. A well structured and organized page, broken down into multiple segments as follows. 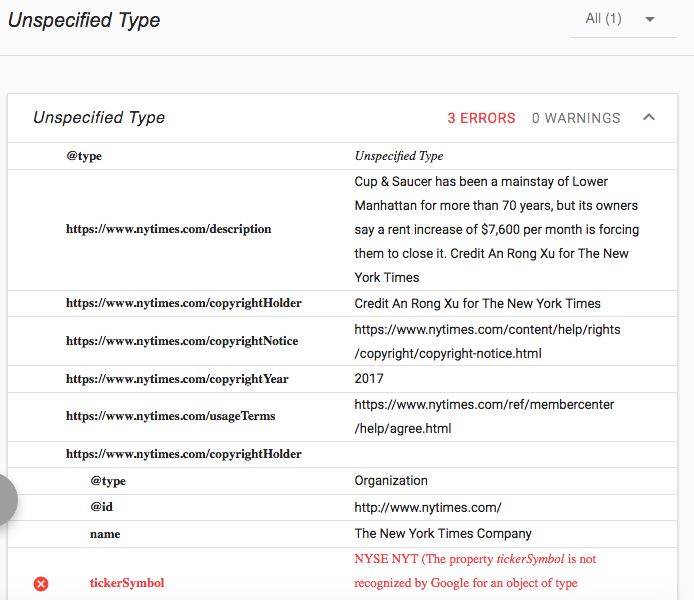 On top of the dialog, we see the caption “Detected”, which means that the search engine detected “Rich Snippets” on the page, and has broken the page down accordingly. Next, we have the WebPageElement section which tells the search engine what is actually being looked at on the page. For example, the link we are testing is under the Research – On Curation page. WebPage segment provides the general properties of the WebPage, including the URL, breadcrumbs, keywords, author, and publisher. Next is the Organization segment which provides details about the mission of the organization, like schools, NGO, corporations, clubs, etc. Finally, the last segment breaks down the elements of the page, into multiple segments. We are using the “Article” schema for our page, and we have 21 article items on our page. Each “Article” item share details about that article. The segmentation and tagging of the article provide valuable information for matching the article with the search. “Rich Snippets” schema offers a number of “Content Types” with different fields describing the items. 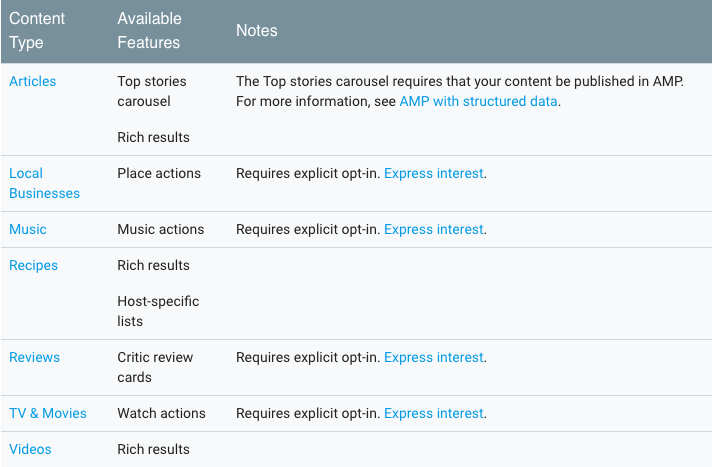 Here is the breakdown of the various content types according to “Rich Snippet” guideline by Google. If a page is not marked by “Rich Snippets”, the search engine algorithm needs to do the work to identify the content based on the HTML tags on the page. 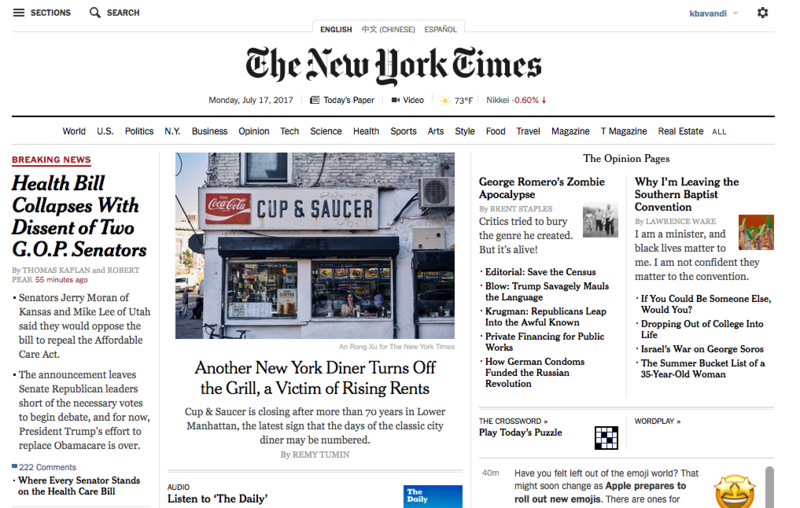 To understand the difference let’s take a look at a website without rich snippets, for example, the front page of NYTimes. Comparing the two pages, it is easy to see why search engines prefer “Rich Snippets”, and how richly annotated pages can help you rank better. 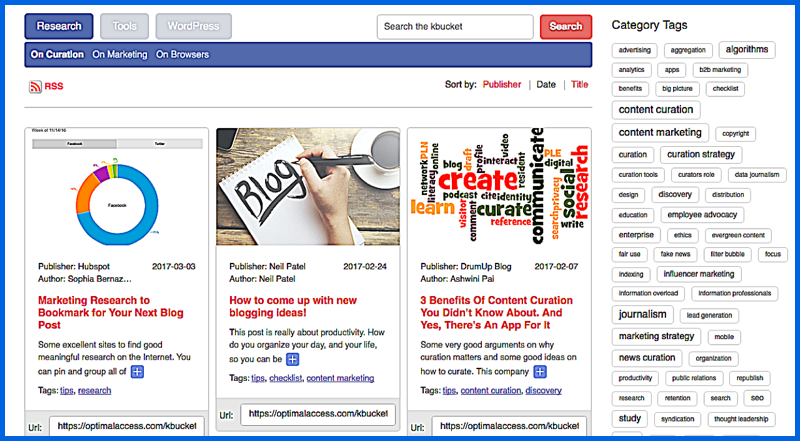 KBucket Pages are “well-organized” and search engine friendly pages for sharing your research online, while you get an SEO boost. 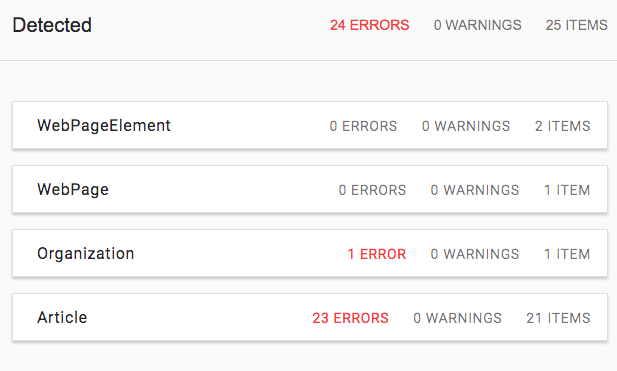 With KBucket, you do not have to worry about any of the technical detail behind creating well structured data. 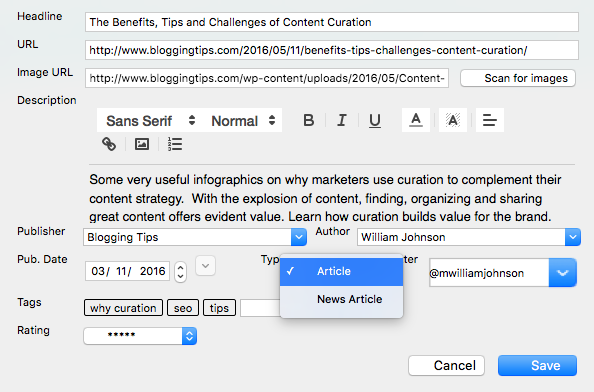 When you curate articles from the web, our programs will automatically mark each field with the correct “Rich Snippet” tags. 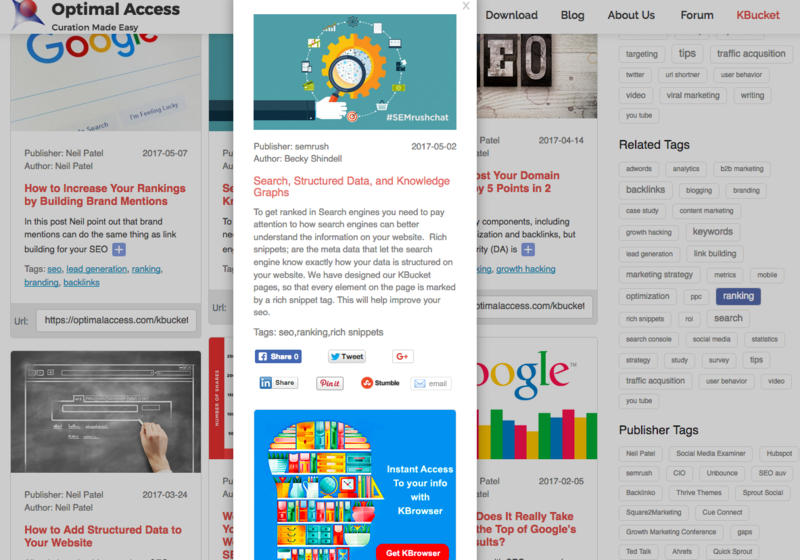 To display the pages, you upload your research via our KBucket WordPress plugin to your site. To create KBucket pages, we use either our KBrowser extension for Firefox, or the Kurator extension for Chrome. The idea behind KBucket is to create assets out of our research, and collect and share the best content on specific topics in one place. 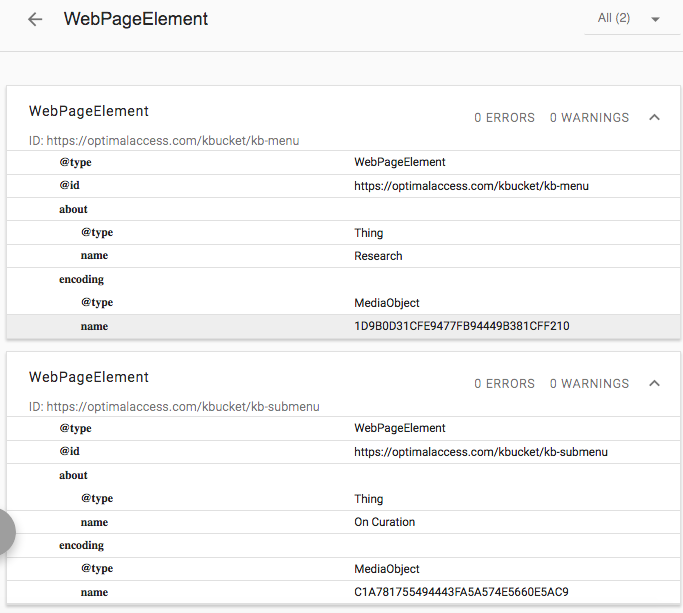 Both our Kurator and KBrowser tools, will automatically scrape any page on the internet, allow you to comment, tag and enhance the information about the link and share it via KBucket pages. We currently just support the “Article” and “News Article” formats for our KBucket. We plan to support all the Rich Snippet content types in the near future. From this article we already know that the KBucket pages are highly optimized for search engines, but you can do more to improve SEO from your KBucket page. First, target the curated content at your customers interest graph. Let me use our own KBucket page as an example to explain what I mean. We have created a set of tools for Content Marketers, focused on Content Curation. We know that our target client in this field has a wide range of interest, not just in our curation tools but also other Content Marketing and SEO related topics. So we have created multiple channels on our KBucket Page, and curate articles on all types of Digital Marketing related topics, including blogging, copy writing, backlinks, ranking, content marketing, influencer marketing, growth hacking and so on. Every article I curate for these pages, I read and offer my own summary of the article. When I write my summary, I further pay attention to keywords that I like to rank for. 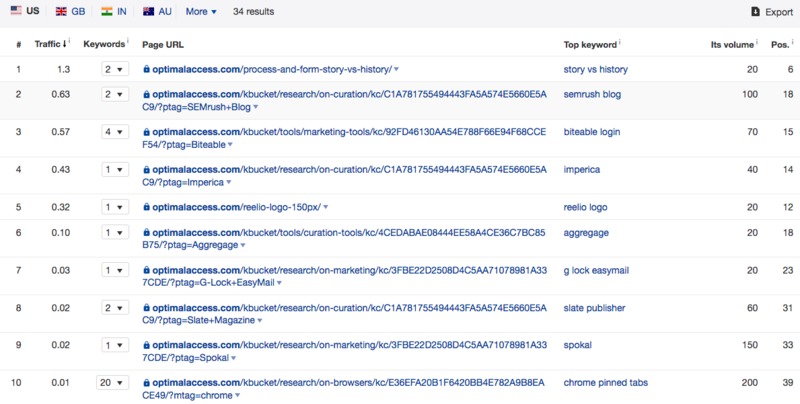 Our KBucket pages and those of our clients have started to rank for some long tail keywords from the KBucket pages. Here is a report from ahrefs, that shows the ranked KBucket pages and the keywords they rank for. You should plan and target keywords in for your descriptions the same way you plan for keywords in your blog posts. Your curated content can target keywords that are not directly related to your products and services but target your clients’ interest graphs. In this way, you can grow your reach and drive more organic traffic to your site. Here is a report for our KBucket page from ahrefs. As an example, lets’s take a look at the “chrome pinned tabs” link on our site. This is an important keyword for us, as I would like to target anyone interested in this keyword to know about our Kurator plugin. The landing page for that link is highly relevant to the search term. Chances are people who land on my website looking for productivity tools, or tips about using the Chrome browser, will also be interested in our Kurator plugin. 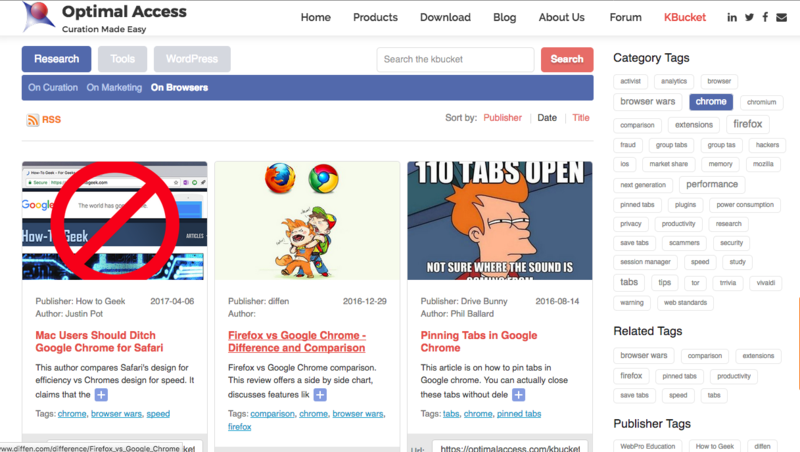 Every article you curate and share from the KBucket page drives traffic back to your site. We tracked our social media shares over a period of 6 months and (How to get 153% CTR with KBucket Content Curation) found that for every link we share we get 1.5 links back. You may perform better if you have a larger reach. We share content on Twitter, Facebook, Linkedin and Google Plus. I have about 5000 followers on Twitter, over 1200 contacts on Linkedin, but the other channels have a smaller audience. I generally schedule my posts through HubSpot or Buffer. I have curated over 1000 evergreen content on content curation, content marketing, SEO and browser related topics and tools, so I can easily share hundreds of articles without repeating my self. So when I share the excellent article by Becky Schiell from “semrush” on “Search, Structured Data and Knowledge Graphs” users will land back on my page, before they click through to Becky’s post. Notice the banner at the bottom of the popup that leads to one of our landing pages. An excellent study by Razvan Gavrilas, titled “Traffic improves SEO and shows that your inbound traffic Affects Google Ranking”, studies how a featured article by Reddit boosted their SEO rankings, concluding that there is a direct and immediate correlation between traffic and SEO ranking. In conclusion, he writes. As another personal experience, I noticed that social media traffic boosted some of our other posts when people started to share them more aggressively. Just like Razvan, we need additional testing and more traffic to show the direct correlation between moderate inbound traffic (1000-2000 clicks a month) and SEO rankings. But we can promise a steady stream of traffic from your posts. 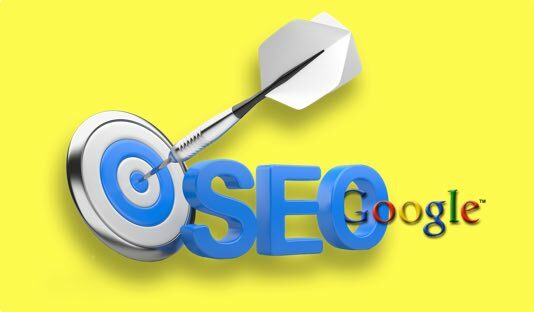 A good SEO strategy will drive organic traffic from search and influencers, generating valuable leads and sales. Most B2B and B2C companies today rely on organic traffic to grow their business. The fact is that you need to do many things right in order to build momentum for your organic reach. I have curated articles from some of the leading experts, and share it under the “OnMakrting” channel, on our site, that offers most of what you need to know about Content Marketing and SEO to be successful. 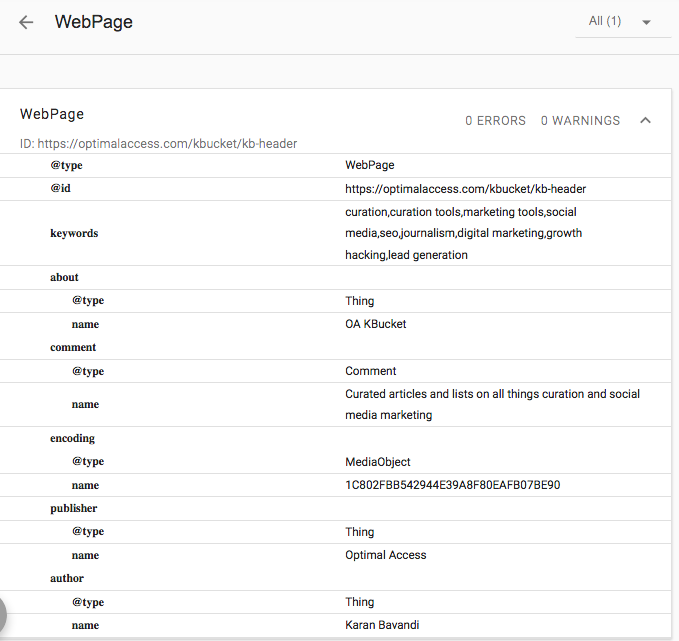 KBucket pages are designed to help you rank, connect with influencers and boost your SEO. Promoting influencer content on your site gives you a good reason to ask for specific favors. Furthermore, when you share the best content on topics of interest demonstrates thought leadership on your part.